Having run away from school at 13, Robert Loraine followed his parents, Harry and Nellie, into the theatrical profession without their support. From acting in the Liverpool Sailor’s Dive he got a place with a touring repertory company and after five years got his first part in the London theatre. It was in his early years in London that he met and married the actress Julie Opp (a short-lived relationship ending in divorce three years later). Having established a successful acting career he succumbed to patriotic calls to join the Army for the Boer War in South Africa. He joined the Montgomeryshire Yeomanry as a Trooper and went to serve with them (joining Imperial Yeomanry 9th Batt., 49th Coy.) in South Africa where he was twice mentioned in despatches. He subsequently returned to civilian life as an actor. In July 1909, Loraine was inspired by Henry Farman’s exploits and decided he wanted to fly. Loraine was also at Sangatte that year to witness Blériot’s successful attempt to fly across the Channel to Dover. For his first aircraft, he decided to purchase a Blériot machine and went to France in April 1910 to learn to fly at Blériot’s base at Pau. It was in his diary at this time that he used the term “joystick” in describing the aircraft’s control column – the first recorded use of the term. Having crashed a machine at Pau he went on to Henry Farman’s establishment at Mourmelons where he got his flying certificate (21 June) and purchased a Farman machine for £7,000. It was here that he teamed up with his engineer Jules Védrines. Loraine was not a good pilot and Védrines was to be kept very busy repairing machines for his enthusiastic boss. Loraine’s first public appearance as a pilot (under the alias Robert Jones) was at the Bournemouth Aviation Week in July 1910. It was on this occasion that he became the first to fly through a rainstorm and the first to land on the Isle of Wight. At the end of the month, he was at the Blackpool Aviation Carnival where Grahame-White was the star attraction. Having made a long endurance flight at this meeting he then attempted to fly the Irish Sea. After an initial failure and a few weeks delay he finally succeeded and on 11 September became the first man to fly across the Irish Sea. Loraine was to add another UK record, that of communicating from the air to the ground by wireless using morse code, when he joined a military exercise on Salisbury Plain on 27 September 1910. So, in a few short months, he had achieved a number of objectives in furthering aviation, proving that it was a practical means of travel and that it might have some military utility. In all this, he had been supported by his friend George Smart, managing the enterprise, and by his engineer Védrines. In 1910 Loraine was one of the first three pilots to be awarded the Silver Medal of the RAeC . Loraine was on the bill to take part in the 1911 Round Britain Air Race sponsored by the Daily Mail newspaper. Unfortunately, he was not ready in time and along with 8 other entrants did not take part. However, his erstwhile engineer, Jules Védrines now a pilot, did participate and came second overall narrowly losing out to André Beaumont by 10 minutes; only two other pilots, Valentine and Cody, of the original field of 30, completed the 1010 mile course. At the outbreak of war in 1914 Loraine was accepted for service by the Royal Flying Corps as a 2nd Lt., Special Reserve. His initial flying performance was unsatisfactory (crashing two aircraft) and he was assigned to be an observer. Arriving in France he was posted to No. 3 Sqn. On 22 November 1914, he suffered a serious wound from ground fire while on artillery observation duties with his pilot Corbett-Wilson. He was close to death but recovered and was invalided home in December. After recuperating on a trip to South America he returned to France in April 1915 only to be recalled soon after for pilot training. He returned to France as a pilot and joined No 2 Sqn at Hesdigneul (flying BE 2c s). In September 1915 he was promoted to Flight Commander and appointed to B Flight of No 5 Sqn flying the Vickers FB Gunbus. He was awarded an MC for shooting down an enemy Albatros aircraft on 26 October. This incident is recorded in RFC Communiqué 16, which notes that he and his observer/gunner Lt. Lubbock, shot down an Albatros within British lines, killing the pilot (Unteroffizier Gereld) and wounding the observer. The 17-year-old observer 2nd Lt. Buchholz of 33 FFA, was able to provide interesting background on his squadron and the German Air Force. The Communiqué lists various equipment found on the aircraft and the contents of a document. Unusually the next RFC Communiqué, No 17, was devoted to an interrogation report on Lt Buchholz, the contents of which (3-4 pages) clearly constituted a valuable intelligence report at the time. Flight magazine at the time reprinted a letter from Lt Lubbock describing the incident. In March 1916 Loraine was posted, on promotion to Major, to take command of a new squadron, No 40, forming at Gosport. No 40, equipped with single seat FE 8 fighters (photo opposite), deployed to France in August 1916. Loraine was a strict commander and demanded high standards which made him unpopular. 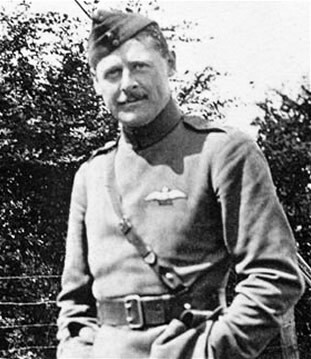 He took command of 14 Wing in March 1917 as a Lt. Col. and in July returned to Home Establishment to command a Training Wing at Andover. It was here that his unpopularity grew through his intolerance of the lack of commitment of trainees. His attitude became associated with perceived high casualty rates among trainee pilots. In the end, he faced a court-martial for being drunk on duty – a charge described by one officer as a “dirty trick”. Loraine was acquitted and in his indignation requested to return to active flying duties, which he did, reverting to Major. He returned to France in May 1918 as CO of 211 Sqn operating DH9 bombers. In July, while continuing to fly operations, he received another serious wound and was invalided home. This was to be the end of his war having been awarded the MC and the DSO, and being MiD four times. Those who placed Loraine in command positions would have been well aware of his reputation and to a great extent, he followed Trenchard’s commitment to support the Army on the ground, accepting the high costs involved. The loss of his close friend George Smart in the trenches in 1917 also undoubtedly affected his behaviour. Those who served with him as colleagues rather than subordinates remembered him fondly as an engaging, larger than life, character. No one would have doubted his commitment or his bravery. Recovering from his injuries Loraine returned to the stage as both actor and manager. He married Winifred Strangman (a cousin of RNAS Sub-Lt. Reg Warneford VC) in 1921 and they had three daughters. As an actor, he was famous for his roles in Rostand’s Cyrano de Bergerac, Strindberg’s The Father, and Shaw’s Arms and the Man. He survives on film from the 1934 movie Marie Galant.